Starting Sept 5, Erie will host its second tallships festival, Tall Ships Erie 2013. It kicks off with the Parade of Sail when nine large masted ships – including our own Niagara – will cruise into Presque Isle Bay under full sail, and the city will undergo four days of festivities, lectures, music, and, of course, tall ships. It's the culmination of a two-year long celebration of Erie's role in history. Or, more specifically, Erie's role in the War of 1812 and in a battle that took place on the lake, a battle that could not have been fought nor won without Erie – or more, a battle that birthed Erie. "As individuals, we live on past triumphs, on high moments," said Dr. William Garvey, president of the Jefferson Educational Society and a chair of the Perry 200 Commemoration, in a phone interview. "We need that as a nation, too." 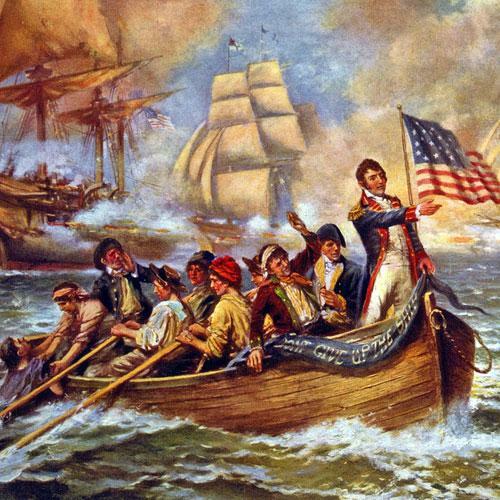 The Perry 200, of course, is the event series that brought you flag-raising ceremonies, picnics, music, history classes, pageantry, fireworks, and a very large parade, all in honor of Oliver Hazard Perry's stunning defeat of a British fleet on Lake Erie on Sept. 10, 1813. Tall Ships Erie is the final act. Besides the Niagara, Erie's reconstruction of the brig that won the battle, other tall ships will populate our harbor. There's the Friends Good Will, a reconstruction of the sloop that rushed off with Perry's famous victory message after the battle, a ship less than half the length of the Niagara. There are the two reproductions of War of 1812 privateers, the topsail schooners the Lynx and the Pride of Baltimore II, both fast-sailing ships with masts leaning rakishly aft. There's the converted Dutch fishing ship, the Unicorn, which now runs a sailing program for girls and women. There's the St. Lawrence II, a Canadian brigantine; the Peacemaker, a barquentine built in Brazil; and the Appledore IV, a two-masted schooner that usually sails in Lake Huron and Saginaw Bay. And there's the steel-hulled Sorlandet, the biggest ship in the festival, and, built in 1927, the world's oldest full-rigged ship still sailing regularly. With its three masts and six banks of sail, she can spread as much as 13,000 square feet of canvas. And for the second time in three years, the ships together will create a skyline of masts that hasn't appeared regularly in our harbor in over a century. This year, too, will be better than the last tall ships festival. Hosted in the Bayfront Convention Center, Tall Ships Erie 2013 will feature a video and lecture series sponsored by Mercyhurst University on maritime and historical topics relating to the Battle of Lake Erie. There'll also be live music in the Labatt Blue Beer Garden at the convention center, mostly of maritime music from Captain Tom Kastle, the Hardtackers, Lee Murdock, and the Good for Nuthin String Band. And in the H.O. Hurt Auditorium in the Blasco Public Library, a collaboration between the Erie Playhouse, Gannon University, and the Flagship Niagara League brings Erie the play, "Fortunate Victory," a dramatic adaptation of the events leading up to and including the battle. "The first purpose," said Garvey of Tall Ships Erie, "is to celebrate the fact that we have the Niagara. It's expensive to maintain, the state supports less than half of it. Having tallship festivals every two or three years generates a lot of cash. That will keep the ship sailing." That's the first and the most practical reason for hosting Tall Ships Erie. It's a fundraiser for our city's iconic ship. That's the practical reason. There are other reasons, too. Ones you can't count in ledger book, but reasons that have value nonetheless. "It reminds people of the importance of the Niagara," said Garvey, "and it does so dramatically. Without Perry's victory, we wouldn't be celebrating right now. Efforts do matter. "The city's pride stems from past successes. There's a quote from Winston Churchill about England that I always thought pertained to cities, too. He said, 'having once been great, we cannot endure being mediocre.'" Erie was born in a singular and historic summer, one in which our city built a fleet of wooden ships and sent it off into danger. And, by doing so, won an important battle that helped shape the republic. This is our legacy. It's our identity. And the tall ships – with their dramatic silhouettes, their walls of wood, the canvas and rope that hold them together – these relics of bygone days should remind us what happened on here two hundred years ago and thus inspire us to carry on. Sept. 10, 1813, found a small fleet of American vessels sailing in a light breeze in the western waters of Lake Erie. The ships were arrayed in single file with a pair of stately brigs at the center of the line, and were headed directly for another fleet – this one British, with six vessels – which was hove-to and waiting for the Americans. Battle seemed inevitable. On the American flagship, the USS Lawrence, was the 28-year-old fleet commander, Oliver Hazard Perry. In paintings from the era, Perry is depicted with untidy, dark curls thrusting forward over a long nose, plump lips, and languid eyes – the epitome in looks of the era's handsome Romantic hero. Despite his portrait's calm, almost bored aspect, Perry's face this day no doubt barely concealed the anxiety he must have felt. After all, the conditions for battle were far from perfect. His fleet was undermanned, some 200 men short of what his ships would ideally carry, and he was woefully short of experienced sailors – raw frontier militia formed too much of his crews. Worse still, a spate of fever and dysentery had swept the ranks and many were too sick to fight. Perry himself was still feeling the effects of illness. Perry's ships, too, were a collection of converted merchantmen and hastily-built vessels. The two biggest – the Niagara and the Lawrence, his flagship – were built of green wood of a mishmash of varieties. Both, too, had shallow drafts and tended to scuttle to leeward in a strong wind. His inexperienced men had little time to train with either the sails or guns. This morning, too, after spotting the British fleet to the north, his fleet had trouble exiting the harbor at Put-in-Bay, forced to beat directly into a southwesterly wind through the shoals and narrow channels of the islands off the north coast of Ohio. He would still be there now, with the British ships swooping down among his disorganized ships if the wind hadn't abruptly shifted to the southeast. That wind change allowed him to enter the open lake quickly and erased his enemy's tactical advantage instantly. Even so, the wind must have been too light for his liking. The British ships, especially the larger ships, the Detroit and the Queen Charlotte, had long twelves, long-barreled cannon that threw shot accurately over distance. The Niagara and Lawrence had the squat, short-barreled guns called carronades that fired 32-pound shot, but accurately only at very short distances. That meant Perry needed to close the gap to the British fleet quickly, or else the long twelves would rip his ships to pieces. On a calm day like this, there was a chance the wind would die altogether, leaving him stranded and helpless under the British guns. As the Americans slowly approached the British, his men, too, must have shared their captain's anxiety. In such light wind, there would be hardly a rustle of canvas, and voices would carry far over the water. The ships were ready for battle. On the Lawrence, wet blankets would have been hung around the powder magazine, the guns' shot racks filled, the galley fire doused, and sand strewn on the decks to give sailors traction against slipping on the blood that would soon flow. No doubt the men stood at their stations in silence peering through their gun ports at the distant ships, wondering who among them would soon be dead. Above them flew Perry's iconic battle flag, reading "Don't Give Up the Ship!" – the dying last words of his friend, James Lawrence, in the last moments of his USS Chesapeake's losing duel with the HMS Shannon a few months earlier. The exact colors aren't known – but it was probably yellow letters on a blue background. Perry had plenty of time to ponder his actions at that time. What was on his mind? Did he think of how he might measure up to his father, a renowned Revolutionary War privateer and frigate captain in the early U.S. Navy? Did he think of his own career, and how it went horribly awry when his first sizable command, the sloop USS Revenge, struck shoals off of Rhode Island and sank? A court martial hearing found pilot error to blame, but the incident stained an otherwise stellar career, and he found himself commanding shore defenses and gunboats, not a frigate on ocean cruises, like other captains of similar experience. It was probably desperation to regain his reputation that drove him to apply for a command on the Great Lakes. In 1813, Lake Erie was mostly wilderness and far removed from the high seas and glory he no doubt sought. He might have been thinking of the army in Ohio under General William Henry Harrison, waiting for the outcome of the battle. Harrison, a Virginia-born and extremely ambitious politician, had assembled his army in the Indiana territory made up of frontiersman eager to end British influence with the Native Americans in the region. These were Kentucky men, Indiana men, Ohio men, men who had already fought at Tippecanoe or a number of savage frontier brawls with the Shawnee, Ojibway, Chickamauga. American soldiers had been slaughtered at the River Raisin by England's Indian allies, and these men were eager to wreak revenge on the British in Detroit – the raids on area villages had not quenched their bloodlust. Harrison had marched this army through hundreds of miles of untracked wilderness and had endured a bloody siege at Fort Meigs on Ohio's Maumee River, but was now bogged down in northern Ohio, unable to march to Detroit for fear of the British ships on Lake Erie cutting off his supply lines in his rear. He had sent a number of impatient letters to Perry. The men had met and liked each other, and Perry no doubt felt pressure to relieve Harrison of his worries. Was he now thinking of Harrison's position, his supply line, the men who wanted to take back Detroit? Or maybe his dispute with his superior, Isaac Chancey, weighed heavily on him. Chauncey commanded all the naval forces on Lakes Ontario and Erie, and Perry felt he had neglected his command, failing to support him with men and material. After reading imagined slights into his recent correspondence from Chauncey, Perry had submitted to the Secretary of the Navy a letter of resignation, which was even now making its way to Washington D.C. "I cannot serve longer under an officer who has been so regardless of my feelings," he had written. "I beg most respectfully and most earnestly that I may be immediately removed from this station." He probably regretted sending it. But a victory now would change everything. Or was he thinking of his second-in-command and captain of the Niagara, Jesse Duncan Elliott? Elliott shared the same rank, "Master and Commandant," but at 31 was the older of the two men and had more combat experience – including a dashing expedition in which he had wrested two enemy ships out from under British cannon on the Niagara River and for which he won Congressional commendation. Elliott, too, was a protégée of Chauncey, having served as his lieutenant on Lake Ontario. Only the luck of two months' seniority gave Perry command. Did any doubts assail Perry about Elliott? Did he feel pressure to excel under the watchful eyes of an older and more experienced man and one who no doubt felt he was more deserving of the post? Across the water, a band aboard the HMS Detroit struck up "Rule Britannia." A shot was fired from the Detroit. It fell short, a splash in the water. Her second shot, however, found its target. There was a splintering of wood as the heavy ball smashed into the Lawrence and killed a man. Perry could not return fire; his guns were not in range. Perry now faced a decision. His fleet was strung out a little. The brigs were together, but his gunboats were lagging behind. He could pull away and consolidate his forces. After all, his fleet outnumbered the enemy nine to six, and threw a heavier broadside, too. Why not wait for more auspicious conditions? Ones that would push the odds more in his favor? But that might mean putting off a battle for a few more hours, or possibly a few more days or even weeks. Did he have the time? Or he could turn the helm over now and head directly at the British fleet with what he had. It meant sailing bow-on at the enemy who would pound him mercilessly as he closed, he unable to return fire for some time. It would be risky – extremely risky. He would be playing into the hands of the British, allowing them to exploit the advantages of their long twelves. But he could fight here and decide the issue now. He ordered the signal flags hoisted – engage the enemy – raised more sail and turned the Lawrence to starboard towards the six British ships. The Battle of Lake Erie had begun. At the outbreak of the War of 1812, Erie was a frontier settlement of a few dozen buildings and about 400 souls. It was first settled by Anglos in 1795, shortly after the federal government decided a land dispute between New York, Pennsylvania, and other states over the "Erie Triangle" – a triangular tract of land that fits roughly over present-day Erie county – in Pennsylvania's favor, giving that state its only port on the Great Lakes. Erie residents were mostly farmers, and merchants and sailors dabbling in salt, fur, and lumber trade. In 1812, of course, there were no gas motors, no cars, airplanes, or railroads. Livingston and Fulton had built the world's first commercial steamboat – which plied the Hudson from New York to Albany – only five years earlier. Travel was mostly powered by muscle – on foot or horseback – but boats allowed people to move large amounts of goods relatively easily, and rivers, lakes, and oceans were the early 19th-century highway system. But in 1812, the Great Lakes were relatively isolated from the oceans and, therefore, the rest of the world. Ground for the Erie Canal wouldn't be broken until 1817, the Welland and Lachine Canals not until the 1820s. In order to reach Erie, a traveler in 1812 needed to go one of several circuitous and arduous routes. One route was along the St. Lawrence River, Lake Ontario, and Niagara River to Lake Erie – but that required two separate portages, once near Montreal and again around Niagara Falls. Or up the Allegheny River and French Creek from Pittsburgh and over a 14-mile dirt track from Waterford. Or up the Hudson to Albany, up the Mohawk Valley to Lake Ontario. And so on. Winter drifted snow on the roads and froze otherwise navigable rivers and lakes, and a trip to Erie that might take days in good weather could last weeks in bad weather. The isolation and rough frontier life appealed to adventurers and entrepreneurs, including Daniel Dobbins, who first saw Erie in 1795 as part of a surveying party. He must have seen the natural harbor formed by Presque Isle and imagined much potential, because he stayed in Erie permanently to work aboard ships that traded on Lake Erie. By 1803, he was captain of a merchant sloop, the Good Intent, which was one of only a dozen on the Lake. Several years later, in 1809, he would buy his own ship, the schooner Salina, and by then was one of the most knowledgeable sailors on upper Great Lakes. It was one customary trip that took Dobbins to Fort Mackinac in the Strait of Mackinac between Lakes Michigan and Huron in July 1812. On July 17, the fort was stormed by 300 British regulars and hundreds of Indian allies, and taken without a shot. War, the British troops informed the surprised Americans, had been declared between their two nations nearly a month earlier. The War of 1812 was an odd conflict without clear cause or outcome. Started ostensibly over British interference with U.S. trade and the habit of British warships of impressing – or forcibly taking – American sailors into their naval service, the roots of the war go deeper than these few high-seas incidents. For one, the British stood in the way of American expansion in the West. There was a lot of pressure for the new republic to push its boundaries westward. The government was cash-strapped, having borrowed prodigiously to fund its revolution, and unable to raise funds from a tax-averse citizenry. Land sales raised cash, and land grants allowed the U.S. to pay its obligations to many of its revolutionary war veterans. And there were plenty of buyers. Immigrants – notably Irish and French refugees – continued to pour into the country, eager to buy cheap land. Nutrient-poor eastern soil combined with primitive agricultural practices – fertilizer wouldn't be widely used until the 1850s – to drive easterners westward to virgin land. The acquisition of the Ohio River Valley from the British after the Revolutionary War and Jefferson's Louisiana Purchase in 1804 gave the U.S. millions of acres of land to settle, but there was one major impediment to American expansion: the people who lived there already. Native Americans. A new confederacy of Indian nations was forming in opposition to the land-grabbing and unfair treaties imposed on their people by the federal government and the ambitious Indiana territory governor, William Henry Harrison. A charismatic Shawnee chieftain named Tecumseh and his brother the "Prophet" drew many followers with a mixture of revivalist religion and the dream of a confederated Indian nation east of the Mississippi. Tecumseh needed the British, however, to realize his plans. Only England could supply the guns and powder the Indians would need to fight a war with the U.S. And England encouraged this hope – a buffer state on the Canadian border would protect it from the Americans – but stopped short of an outright alliance. Westerners were not happy with this British influence. They were in near constant conflict with Indians on their frontier, and they felt the British were responsible. They wanted to smash Tecumseh's confederacy and end British influence in the West, permanently. In 1811, militia and U.S. regulars under governor Harrison broke up the confederacy's encampment on the Tippecanoe River, but the battle only drove Tecumseh into the arms of the British when war was declared in June 1812 and the confederacy's warriors were crucial to the British capture of Fort Mackinac. There, Dobbins was captured and granted parole – an agreement not to fight in exchange for his release – and was ordered by the British to transport paroled Americans to Cleveland. He made it as far as the U.S. fort in Detroit, where his ship was commandeered as a transport vessel. That fort, too, was captured in mid-August, when Detroit's commander surrendered to a smaller British force out of fear of what reprisals their Indian allies might make if he resisted. Dobbins was captured again and was in danger of being executed for violating his parole, but he appealed to an old friend – John Nichol, a Scots-born Canadian trader who was now colonel of provincial militia – for a pass to Cleveland, which was promptly granted. Dobbins brought the news of the capture of Fort Mackinac and Detroit to Erie, where he was urged to bring the news to Washington. In September, after a two-week trip, he spoke to President James Madison and his cabinet. There, the president asked him the best location to build a fleet on Lake Erie, and Dobbins, obviously, answered: Presque Isle. Over the course of the next six months, the settlement on Presque Isle Bay bustled with activity. Its population nearly doubled with the sudden influx of militia, boat builders, and the workers needed to support them. Locals flocked to Erie to cut timber for the ships. Others fed the troops, transported the iron and other material needed for the ships. And many worked furiously to build six ships to challenge the British. It started with $2,000 in funds given to Dobbins by President Madison, and four gunboats being built at the mouth of Lee's run – near where the present-day Myrtle Street ends. Later, the work would be expanded when the regional naval commander, Isaac Chauncey, visited Presque Isle and saw the work. He ordered two of the gunboats to be lengthened and hired the New York City shipwright Noah Brown to build two brigs at Erie. Brown hired some 200 workers, and the work on the brigs began at the mouth of Cascade Creek. Oliver Hazard Perry arrived on March 26, 1813, to take control of the operation. Dobbins took charge of procurement – an awesome task, given the remoteness of Erie and the amount of supplies the brigs needed, the cannon, the shot, the iron fastenings for the ships, the lead for the ballast, as well as oil and paint and a myriad of other supplies – all of which had to be hauled in from Buffalo or Pittsburgh. Prices in the settlement started to skyrocket, with all the money brought to the area by the federal contracts and the workers, and Dobbins had to impose price controls and rationing. But by the end of the summer of 1813, the ships were built, and together with some ships from Black Rock, near Buffalo, a small fleet was assembled and ready to enter the lake. But one major obstacle lied in their path: a sandbar sitting at the mouth of the harbor. Normally only six feet under water, the sand bars were what made Presque Isle Bay a feasible location to build the fleet. The British ships' draft was too deep to enter the harbor; if they tried, they would be stuck on the sand in the harbor mouth and vulnerable to capture or destruction. But now the two brigs would have to cross that sand to engage the British. The Lawrence and the Niagara had been built with shallow drafts – only 8 feet – for the very purpose of being able to get them over the sandbars. But, now, at the beginning of August, thanks to wind pushing the Lake Erie water westward, there was only four and a half feet of water over the sand. On the morning of Aug. 1, the Lawrence was the first to try to cross the sandbar. Two "camel" scows – box-like barges – were placed alongside her, and filled with water. When the Lawrence struck the bar, the camels were drained of water so that they would float and lift the brig. Her guns and two smaller anchors were removed, and her anchor was dropped ahead of her and her crew at the capstans pulled the ship to the anchor, inch-by-inch. Twelve hours later, the Lawrence passed the first sandbar. The next day, the process was repeated for the second bar, and twenty-two hours later, on Aug. 3, the Lawrence had successfully passed it. The next day, on Aug. 4, the British arrived. The Lawrence was still being refitted after her trip across the sand bars, and the Niagara was as good as a hundred miles away, just inside Presque Isle Bay. If the British fleet commander Robert Barclay had attacked then, he probably would have destroyed the American fleet. But from his vantage-point, it appeared as if both brigs were over the bars and ready for action, and Perry sent out his schooners, the Ariel and Scorpion, to fire on the British, confirming the impression that the Americans were ready for battle. Barclay left, fearful of the larger American fleet. Disaster was averted. On Aug. 5, it was the Niagara's turn for the crossing. Perhaps having done it once already taught the men the best method in passing the sand bars, or perhaps the water level rose, but it took only one day for the Lawrence's sister ship to exit the harbor. The Americans were on the lake. Ahead of the Lawrence, the Scorpion and the Ariel closed with the enemy, too, as did the converted merchantmen brig, the Caledonia, immediately behind Perry's flagship. But the Niagara did not. Instead, she hung back out of the range of the British guns. As the Lawrence crept on, bow-on towards the British line, the Detroit and the Queen Charlotte concentrated their fire on Perry, raking his flagship as it closed. One of the better accounts of a sea battle of the era comes from an English surgeon, Samuel Leech, who served on the HMS Macedonian during its losing battle with the USS United States in October 1812. His experience no doubt mirrored that of the crew of the Lawrence. "The roaring of cannon could now be heard from all parts of our trembling ship, and, mingling as it did with that of our foes, it made a most hideous noise. By-and-by I heard the shot strike the sides of our ship; the whole scene grew indescribably confused and horrible; it was like some awfully tremendous thunder-storm, whose deafening roar is attended by incessant streaks of lightning, carrying death in every flash and strewing the ground with the victims of its wrath: only, in our case, the scene was rendered more horrible than that, by the presence of torrents of blood which dyed our decks...."
Perry was able to bring the British to within range of his carronades, and began to slug it out with the enemy at close range for nearly two hours. The cost was high. Casualties mounted. By the end of the two hours of close fighting, 22 of the Lawrence's 103 crew were dead and 61 wounded. Blood dripped between the seams of the deck onto the wounded in the wardroom below. The ship's lines were shot away, leaving the Lawrence unable to maneuver, its hull riddled with shot. Nearly every gun facing the enemy was disabled. Still, the Niagara hung back. Why was later a matter of heated dispute. Those that defended Jessie Elliott, claimed both that there was not enough wind to bring the ship into action and that Perry's signal flags were impossible to read in the smoke of battle, leaving him unable to see his orders to close with the British. Certainly cowardice played no role in Elliott's decision to hang back; he had already proved himself in combat on the Niagara River and on Lake Ontario, even receiving commendation from Congress on his bravery. What's likely is that Elliott saw an inexperienced commander make a rash decision to close bow-on to the enemy and opted not to follow in what he probably perceived as a mistake. Perhaps Elliott thought he could preserve at least one of the fleet's larger vessels for fighting another day. Or perhaps the ambitious officer saw in Perry's risky maneuver the chance that the Lawrence would be lost and his commander killed, and the fleet his. Whatever the reason, the Niagara stood mostly unscathed just out of action while the Lawrence was battered to pieces. "Finding she could no longer annoy the enemy," wrote Perry later, "I left her in charge of Lt. Yarnall...[T]he wind springing up, Capt. Elliott was enabled to bring his vessel the Niagara, gallantly into close action. I immediately went on board of her." Perry turned over his flagship to his lieutenant and took his battle-flag and a few men to a cutter and rowed out to the Niagara – amidst shots from the British cannon targeting the American commander – which he promptly commandeered, sending Elliott to the lagging gunboats to bring them into action. Within minutes, the battle would be over. The Niagara, taking advantage of the fresh breeze, pierced the British line. The Queen Charlotte had her officers killed or wounded in the engagement with the Lawrence and had her rigging shot away, and she collided with the Detroit, leaving both ships helpless. Two close-on broadsides from the Niagara compelled the ships to surrender, and the battle was over. As the cleanup, repair work, and tending of the wounded carried on as usual in the aftermath of a battle, Perry found time to scrawl a hastily written note on the back of an envelope. It was addressed to General William Henry Harrison, who was with his army in Ohio and anxiously awaiting news of the battle. The rest, as you might say, is history. With Perry controlling the lake, General Harrison was able to march on Detroit without fear of having his supply lines cut off behind him. He recaptured the town and its fort, and drove the British and their Indian allies eastward before catching up to them at the Thames River on the north shore of Lake Erie. Harrison won a short but decisive battle there, his forces killing the Indian leader, Tecumseh. Americans had control of Lake Erie, the Northwest frontier, and ended the threat of an unfriendly Indian confederacy blocking settlement. The West was open for American expansion, and William Henry Harrison was elected President in 1840. Perry was awarded a Congressional medal for his actions during the battle, and he was finally given command of his frigate, the USS Java, being refitted in Baltimore. In his battle report, Perry would write that Jesse Elliott "behaved with his customary gallantry," but word got out from survivors about the Niagara's inaction during the hottest part of the fight. Elliott, never one to shy from a challenge to his reputation, demanded stronger praise from Perry, which never came – a non-reply that kicked off a years-long feud between the two men. At one time, Elliott even challenged Perry to a duel. Perry, for his part, later pressed the Navy for an official court martial of Elliott, but was mollified by the promotion to Commodore and the assignment of a diplomatic mission to South America. While there, he contracted yellow fever and died soon after. He was 34. Elliott went on to serve a long and distinguished career in the Navy, culminating in his 1845 promotion to commandant of the Philadelphia Navy Yard. "If Perry had been hit and not made it to the Niagara," wrote Senior Captain of today's Niagara, Walter Rybka, in his book, The Lake Erie Campaign of 1813, of Perry's row across the lake under fire, "his name might be only a small, sad footnote about a rash and inexperienced young commander who died in futility after abandoning his men and fleeing his ship in defeat, while clutching a banner proclaiming, 'Don't Give Up the Ship!' In his place there would now be the name of Elliott on all of the statues, in Elliott Squares, in Elliotvilles and in Elliott counties all over Ohio, Pennsylvania, and New York." Daniel Dobbins stayed in the Navy until the mid-1820s. Later he'd direct area port improvements, run a steamboat company, and became a captain in the U.S. Revenue Cutter Service. No friend of slavery, Dobbins assisted the Underground Railroad by helping escaped slaves find passage to Canada across Lake Erie. He died at age 80 in 1856. Dobbins is buried with his wife in Erie Cemetery. The Niagara and Lawrence were taken out of service after the war and sunk in Misery Bay. Later, the remains of what was believed to be the Lawrence were recovered and sent to Philadelphia for the nation's centennial celebrations in 1876, but were lost to fire. The remains of the Niagara were recovered for the 1913 Centennial, which were used as guidelines for the first reconstruction of the brig. That first reconstructed Niagara was towed to Great Lakes ports by the USS steamship Wolverine that summer for centennial celebrations of the Battle of Lake Erie. After its tour, it was berthed in Erie, and soon began to decay. Work on a second reconstruction began in the 1930s, whose hull was launched in 1943. In 1945, it was moved to dry land and remained there until 1988. It, too, decayed. The third and current reconstruction began in the 1980s, envisioned this time as a sailing ship, and its hull was launched for the 175th anniversary of the Battle of Lake Erie, on Sept. 10, 1988. By 1990, the brig was finished, and it made its maiden voyage in 1991 under the command of Walter Rybka. And now the Niagara is again at the center of an anniversary celebration. "Erie is Niagara's home," said Wesley Heerssen, captain of the Niagara. "I don't think Erie would be Erie without the Niagara. And Niagara certainly wouldn't be the same ship without Erie." Sunburnt, with a thick red beard and ponytail, Heerssen had just finished a cruise on the Lakes, and returned to Erie without his ship to help prepare for Tall Ships Erie 2013. "For all these ships that we've sailed around with all summer long," he said, "they've seen the Niagara. Now to get to see our home port, to see our home facility, it makes me feel proud of what we've accomplished here, and what we have to show for all of our hard work here." Heerssen referred to the Niagara's woodshop and rigging shop, both located in the basement of the Erie Maritime Museum. The museum itself is one of the finest of its kind in the nation, and housed as it is in a former power plant, its basement is large enough to contain not only all the spars and topmasts and sails during the offseason, there's enough room for the equipment and workspace to work on maintenance projects during the winter, when rigging needs replacing, block and tackle re-varnishing, lines seized and served. And rot removed and repaired. "Wooden ships in freshwater last only so long," said Heerssen. "For the last 25 years, we've been able to maintain her in like-new condition. If a little bit of rot pops up, we cut it out, glue in a new piece of wood, replace it. The number of rot pockets we'll have to cut out and replace are going to start growing and increasing in number every year, and it'll require more staff and more resources to keep it in good shape. "The day is going to come, without a doubt, when she is going to need a significant refit." In that way, there's a little bit of danger in the celebrations this summer, too. "The bicentennial of the Battle of Lake Erie is deserving of commemoration – and we're going to do our best to do justice to that responsibility," said Heerssen, "but what happens in three or four years? When the gloss wears off?" Heerssen lives, breathes, and sleeps Niagara every day of every week. He's focused on the ship's survival. And the survival of the ship's mission. "Tall ships inspire people," he said. "At the end of the day, a vessel is a tool. You're carrying something on it, whether it's cargo or passengers. Our cargo is inspiration. It's heritage preservation. "As Walter [Rybka] likes to say, 'heritage preservation is attitude preservation.'" In the end, though, Heerssen is not too concerned about the ship's future. He knows the passion of the people of Erie for the Niagara, because they tell him. And, yes, while Tall Ships Erie is the culmination – the end – of our bicentennial celebration, it should also serve as a kind of beginning of a renewed commitment to the ideals and actions of the men that first built the Lake Erie fleet, and then sailed it to battle. We have a chance at greatness, and it begins – and continues – with the Niagara. Jay Stevens can be contacted at Jay@ErieReader.com, and you can follow him on Twitter at @Snevets_Yaj.